LED dimmer with 4 channels (RGBW or single channels) oriented to LED technology with constant voltage regulation and DIN rail mounting (4,5 units). 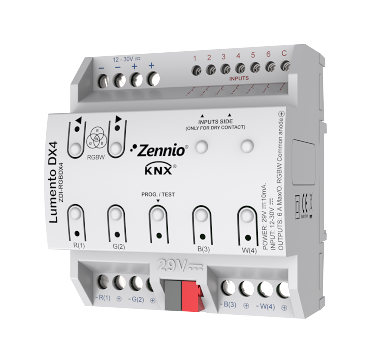 The dimming channels can be configured as 4 independent channels, 1 RGBW channel or 1 RGB channel + 1 individual channel. It includes 6 analog-digital multifunction inputs that can be configured as binary inputs for sensors and potential-free push buttons or as motion sensor inputs. It has manual test buttons to check the channels functioning. Power supply: 12-30VDC. Maximum current per channel: 6 A.